Microfiber materials - We are a direct importer of microfiber / vegan leather. We offer microfiber products for various applications of shoe manufacturing to be apllied as linings, upper materials, counter linings and cover linings. The tear resistance, abrasion resistance, and tensile strength qualities of our microfiber leathers are all beyond of real leathers. They have excellent breathability and colour fastness as well. They meet all the specifications required by ISO 20345, ISO 105-E04, ISO 12947-2 and ISO 14268, which are certified by PFI Pirmasens. 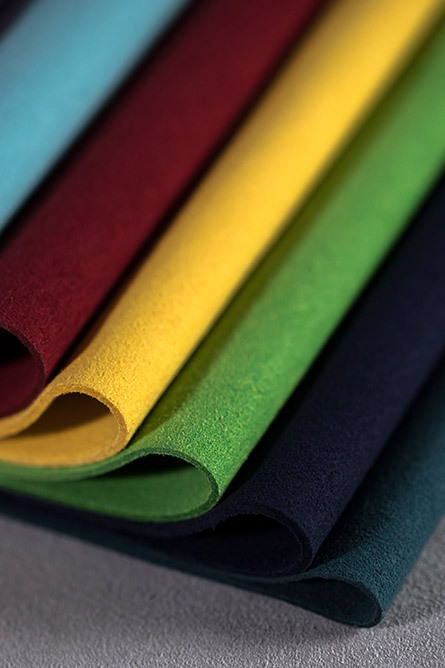 We offer three product lines in a wide range of colours: velour, thin coated breathable lining, and PU coated upper material. Basic colour can be shipped on tight schedules as they are available in our stock around the year. Pell: This product line matches the characteristics of natural velour. We primarily suggest this to be used for heel lining or grip. We sell it from wide range of thickness from 0,8 to 2mm. Skin: It is coated with a thin breathable PU layer. We mostly recomend it for sole lining. Its thickness is 1 mm. Coat: Vegan leather with a thin PU coating. It can be used as upper material thanks to its thickness and durability. It is between 1,4 and 2,2 mm thick.